Robert F. Kennedy Memorial Stadium or simply RFK Stadium for short, is a multi-purpose sports arena which is currently home to Major League Soccer side D.C United, and often holds football matches of the men’s national soccer team. First opening back in October 1961 under the name of District of Columbia Stadium, the ground was conceived as a joint venture between the management of DC Armory, a quasi-public organisation and the United States Department of the Interior. Designed for baseball matches however it was also designed to host matches of the NFL. Renamed in honour of the famous public servant and presidential candidate Robert F. Kennedy in January 1969 who was sadly assassinated, the ground is commonly abbreviated today to just the RFK Stadium. So far the stadium’s operators Events DC have resisted temptations to commercialise the ground’s name which is largely uncommon in American Sports. 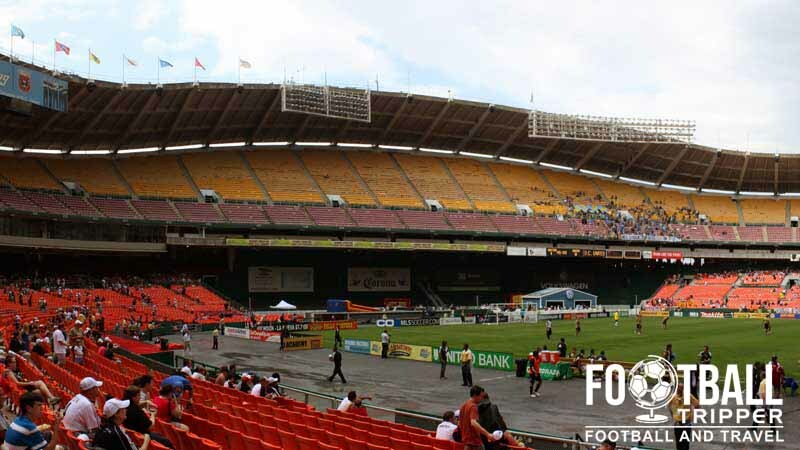 Circular in form, the RFK is capable of accommodating a rectangular pitch – a fact which was perhaps best demonstrated during the 1994 World Cup when it hosted five matches. Although these matches helped to demonstrate the feasibility of Soccer in the RFK, the had stadium previously hosted large games in the 1980s and early 1990s such as A.C Milan against Torino F.C in the Supercoppa Italiana. 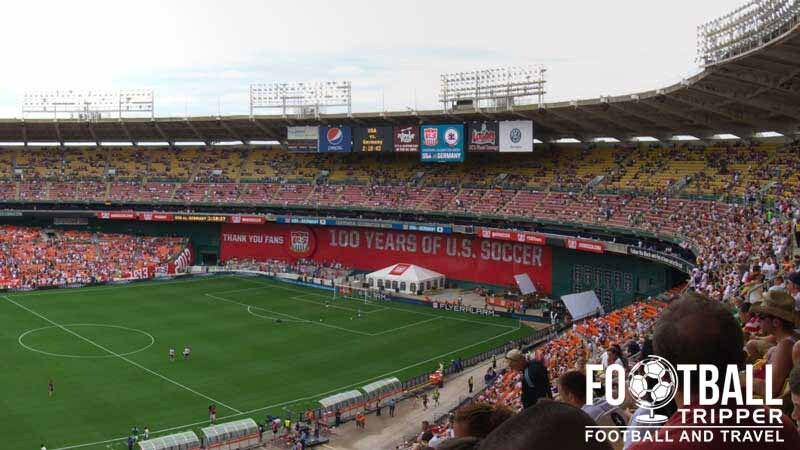 With the tournament undoubtedly helping to cultivate the city’s interest in the sport, DC United were chosen as one of 10 founding members of the MLS, and the club moved into Robert Kennedy stadium two years later in time for the inaugural season in 1996. 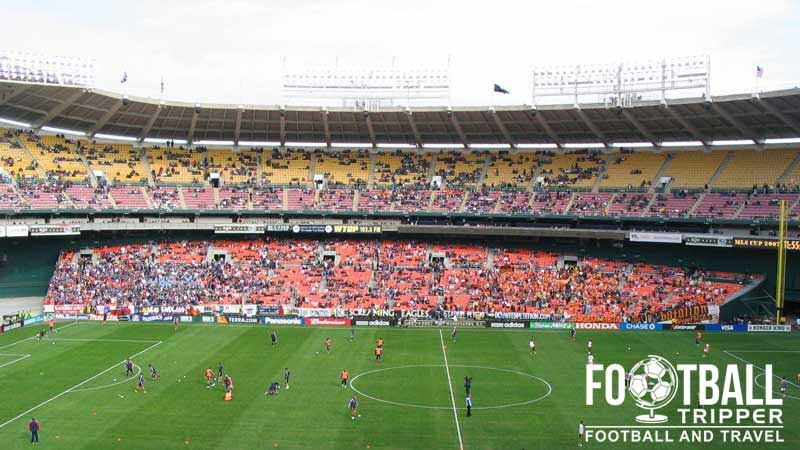 Famously the RFK has been home to the debuts of Ronaldinho for Barcelona, and David Beckham for LA Galaxy, with the latter match attracting a sell-out crowd of 46,686. 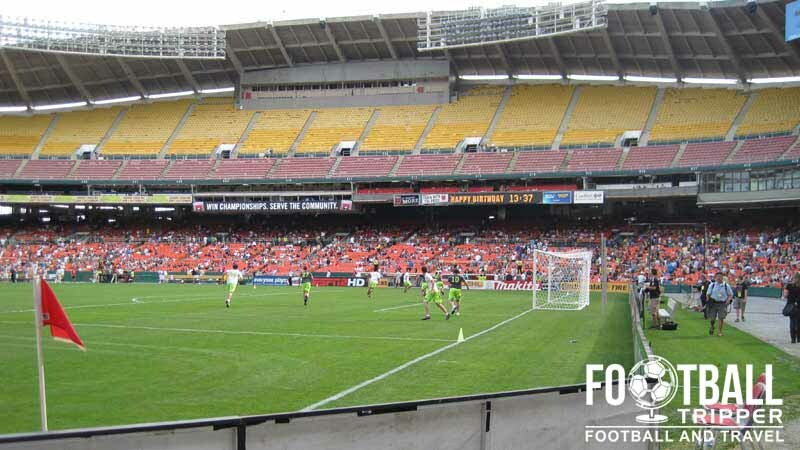 Besides the matches of the World Cup DC United’s ground has also hosted high-profile matches such as the MLS Cup in 1997 and 2000 in addition to the 2002 All-Star Game. RFK Stadium is comprised of four stands: North, East, South and West. Section 318 is usually reserved solely for fans of the visiting team, with no tickets for this section sold on the day of the match. Instead, visiting fans must purchase the tickets from the club’s supporters group, although in American sports it is customary for both sets of supporters to sit together throughout the stadium. Located out of town, there aren’t too many walkable bars around the stadium with the closest options being the small congregation of watering holes northwards towards Carver/Langston. There is the likes of Langston Bar & Grille which “serves soul food in comfy digs”, The Argonaut which specialises in sea food and the Rock N Roll Hotel which contrary to name, is actually just a bar which has live music. There are of course numerous kiosks and outlets to grab a cold one from at the stadium itself with Heineken being the current official supplier of beer. Known as Beer Gardens you can also purchase the likes of Strongbow, Budweiser, Bud Light, Stella Artois and Boddingtons. Within the concourses of Robert Kennedy there are over 13 different types of food outlets to choose from with Centreplate Catering offering DC United supporters everything from Latin to Carribbean, and Mexican to Italian. Fans inside the ground are literally spoilt for choice, and this makes up for the lack of options on route to the arena. The DC United Team Store is located next to the Main Gate and is usually open for up three and a half hours before kick-off as well as Monday to Fridays: 9.30 am – 5.00 pm. Inside the concourses of the stadium there also a number of smaller merchandise kiosks which fans can purchase DC paraphernalia from. The exterior of the DC United Team Store. This is the only permanent location for fans to buy merchandise from all year round. Lastly, fans can browse sporting goods 24/7 from the comfort of their homes by visiting the DCU Team Store website which is run in partnership with Adidas. Although the operators of RFK stadium previously ran a small number of tours around 10 years ago, it doesn’t appear as if they do so today. If tours become available to the general public once again we’ll be sure to update this section. 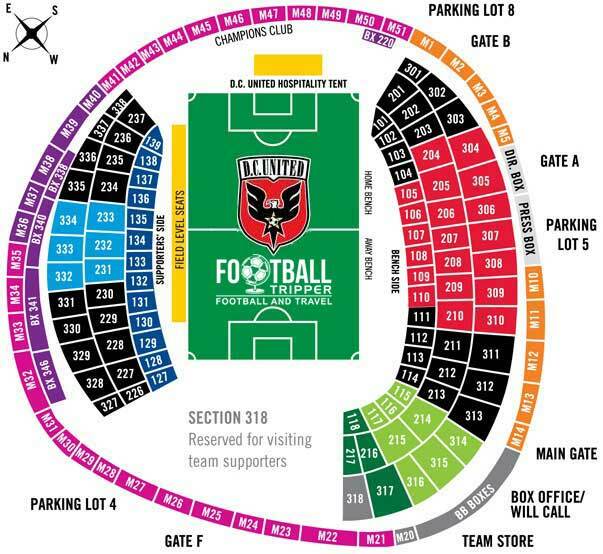 Tickets to see DC United play at the RFK Stadium can be purchased online from Ticketmaster which is the club’s official online vendor, and typically cost anywhere between $25.00 – $65.00. On the day of the match unsold tickets can be purchased at Gates A and F for up to two hours before kick-off, as well as at the Main Gate Box Office. RFK Stadium is tucked onto the western shore of the Kingman Lake which is partly adjoined to the Anacostia River, east of Washington’s famous political centre. 2400 East Capitol Street Southeast, Washington, DC 20003, United States. Parking costs $20.00 for cars with buses, limousines and RVs priced at around $45.00 per vehicle. The large car parks at Robert Francis Kennedy Stadium all permit Tailgating providing that you are responsible, safety conscious and don’t take up more than one space. RFK Stadium is located to the rest of Washington via the orange, blue and silver MetroRail services. The nearest stop is the Stadium-Armory station and you can find out more information by visiting WMATA.com – The Washington Metropolitan Area Transport Authority. Fans displaying a “Keep DC United” after their were talks that the franchise could be relocated in part due to a lack of stadium ownership. Fears have since been allayed. Like a lot of American stadiums cycling is actively encouraged with DC United providing fans with a good number of places to safely lock their bikes on matchday. There are a distinct lack of hotels within the immediate vicinity of RFK Stadium, with the closest congregation of hotels being back towards the Union Station and Presidents Park. Two affordable options are the Capitol Hill Hotel and the Washington Court Hotel.